Supporting for amplifiers that produce high bass sound is a tone control. The amplifier should be supported by the tone control that can produce high bass sound. 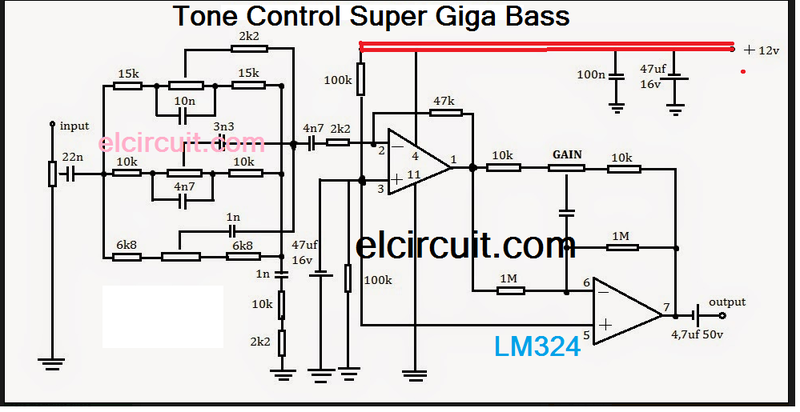 Here I will try to share how tone control circuit that can make the sound that came out was the sound of a low or high bass. You can own creations or test the circuit itself by tinkering with existing components. Tone control is put on without transistor but it uses IC LM324 or you can use the equation to another, you will feel satisfied.If you want to use an additional transistor output of the transistor should be minimized so that the IC is not too hard to work with because the effect will magnify the voice low but can solve his voice and worry if it is not too dense will actually damage the speakers themselves. Below is the tone control circuit made in my own, but if not satisfied, you can change it at will. The circuit you can see below. 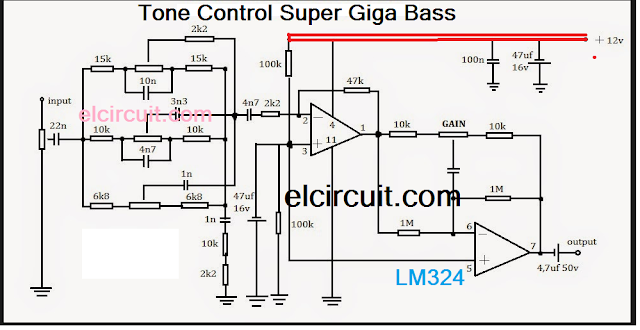 Tone Control Super Giga Bass is a circuit for amplifier OCL support, for that you should be careful in the assembly process because if there is the slightest mistake could damage the power amplifier. Actually there is another secret you should know that for the power amplifier transistor should use the original, and there is also another advantage of OCL Power amplifier that can produce low noise.